I have a more positive outlook on things now that my head is no longer throbbing, and my body has returned to equilibrium (or closer at least). Tiny rushes of excitement come and go as I think about heading off to Boston in the spring of 2011. And while I have not yet begun packing, I have clicked over to the BAA site. Naturally, when I saw “Keeping Pace” prominently displayed on their site, I took it as a sign of things working out – one way or another. Either the Portland Marathon and their timing company will produce documentation of my qualifying results or BAA will have sympathy with my situation. I’d prefer to have an official qualifying time posted as not only do I want credit where credit is due but I also want the option to run Boston in 2011 and/or 2012 on this qualification. Anyway, I’m starting to get a taste of what’s ahead and it sure is yummy. 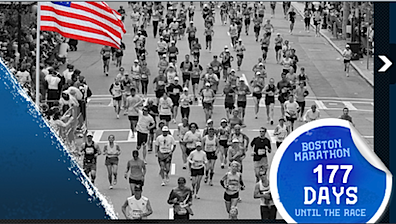 The 115th running of the Boston Marathon: pretty cool! And it’s only 177 days away.